No doubt you’ve encountered a wealth of “firsts” since you began your life at USC, and perhaps one of them is managing your own finances. Financial independence brings lots of exciting opportunities as well as a host of responsibilities. 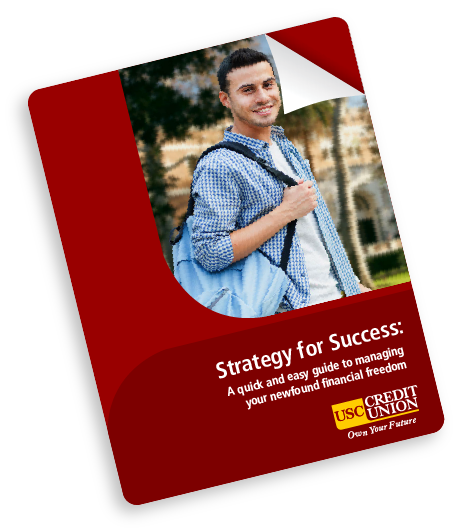 As you continue your path through USC and beyond, we're here to help you establish good financial habits and give you the tools to build a strong financial future. That's why we've created this Student ebook especially for you at this stage of your journey! Become a member-owner of the only non-profit financial institution dedicated to TROJANS LIKE you! COMPLETE FORM TO RECEIVE YOUR FREE EBOOK!